My childhood friend and I recently started a tradition of meeting up for the lunar new year. Last year was the fancy afternoon tea at Tres by Jose Andres at the SLS Hotel. Two years before that was dim sum at Sea Harbour Seafood Restaurant - Rosemead. So for the Year of the Dragon we decided to sort of go back to the beginning. 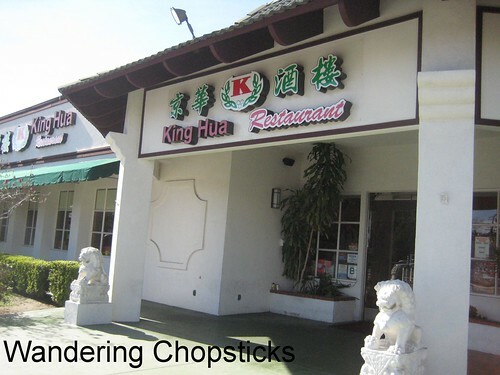 Rumor has it that some of the chefs at Sea Harbour jumped over to King Hua Restaurant in Alhambra. 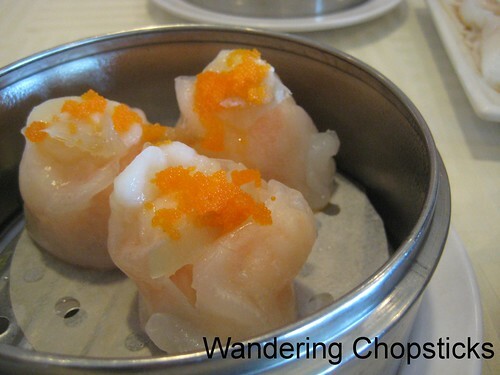 We were hoping for the upscale dim sum like at Sea Harbour but without the upscale prices. Every time I passed by the restaurant, I always wondered what the inside was like. The interior was a lot nicer than I expected with the gold brocade-covered chairs and the pretty Chinese frog buttons down the back. 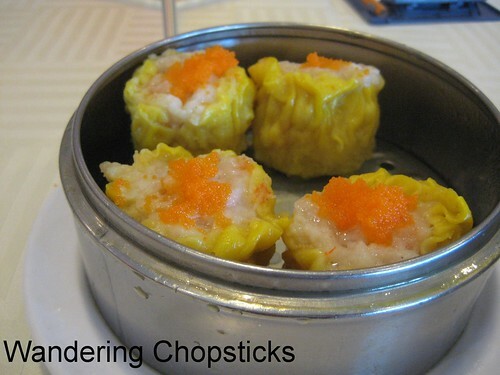 The dim sum prices ranged from $2.48 small, $3.48 medium, $4.48 large, and specials were $5.88 and $6.88. A low price point of $2.48 sounded good until I realized that nothing good was for that price. 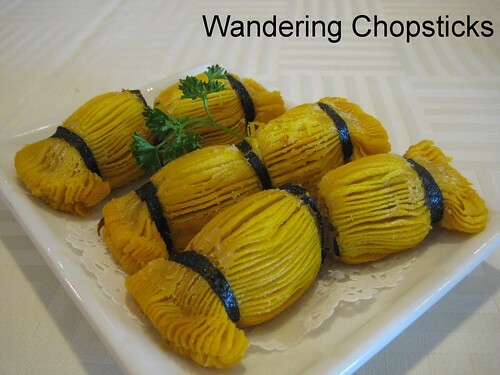 Or well, none of the savory dim sum, just mango pudding and almond pudding. So not as cheap as I'd hoped. 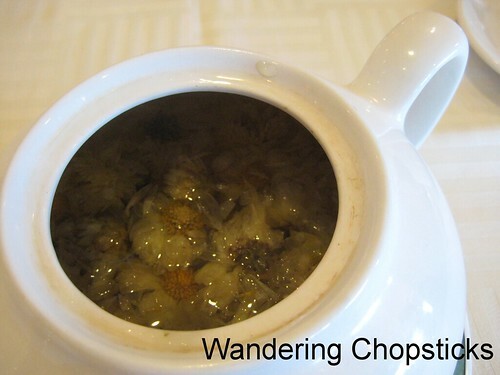 We started off with my usual order of chrysanthemum tea, petals only, $1 each person. 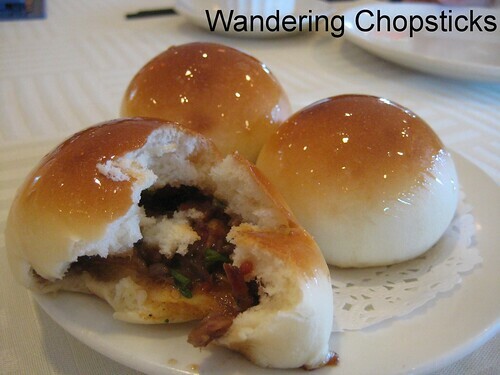 Char siu bao (Chinese barbecued pork buns), $3.48 medium. Soft, sticky bun and savory filling. 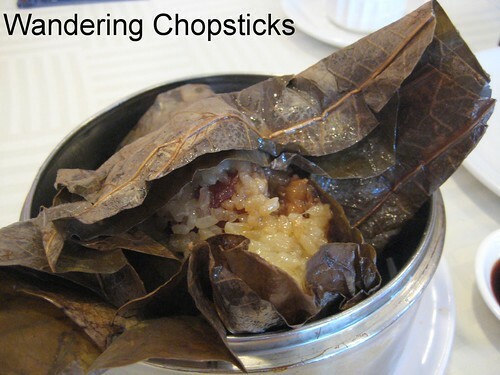 Lotus leaf-wrapped sticky rice, $4.48 large. 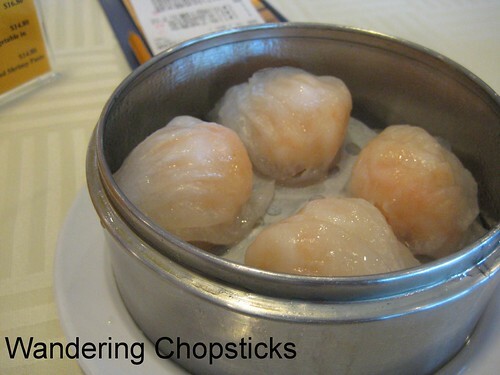 Siu mai (Chinese shrimp and pork dumplings), $3.48. Har gow (Chinese shrimp dumplings), $3.48. Deep-fried lotus root puff, $4.48 large. These looked really nice, but unfortunately the frying oil was a bit old-tasting. Blech! The filling was crunchy and a bit savory. Would have been really good if the frying oil was fresh. Shrimp cheorng fun (Chinese rice noodles), $3.48 medium. 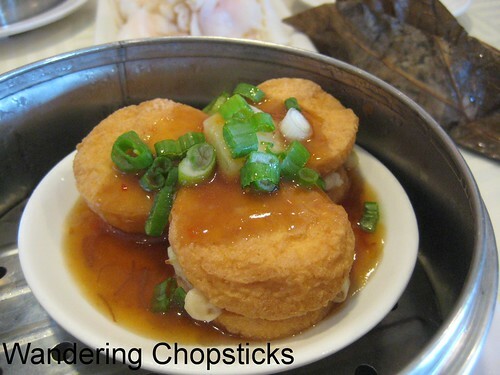 Deep-fried egg tofu with scallops in abalone sauce, $4.48 large. Very soft tofu, with yummy umami-rich seafood filling and sauce. 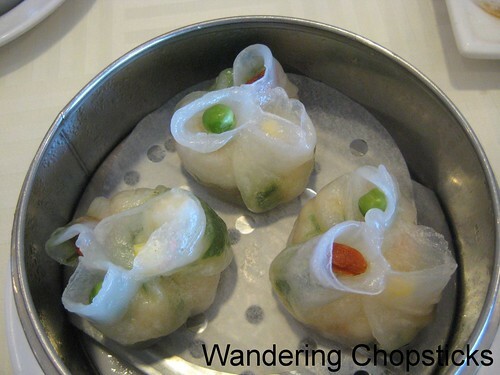 Steamed shrimp and scallop dumplings with shark fin, $4.48 large. Visible pieces of shark fin too. Steamed shrimp and pea tips dumplings, $4.48. I loved the cute arrangement of the tops of the dumplings. 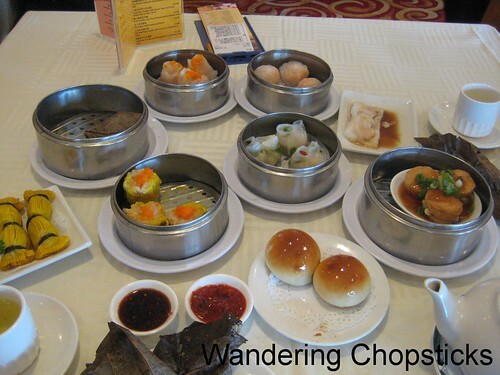 I love seeing pictures of all the dim sum plates on the table. 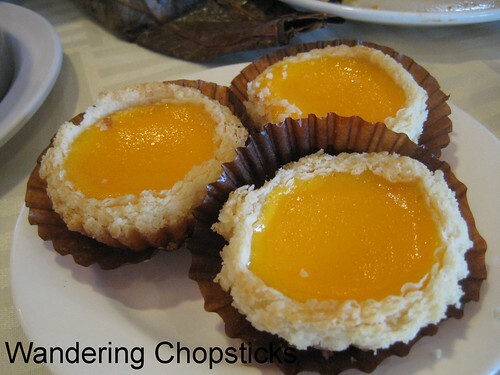 King Hua egg custard tarts, $3.48 medium. These were fine, but I had hoped for Macanese egg tarts, which are better. The bill was $45.46 before tip for two teas, five medium, and five large dim sum. Ouch! 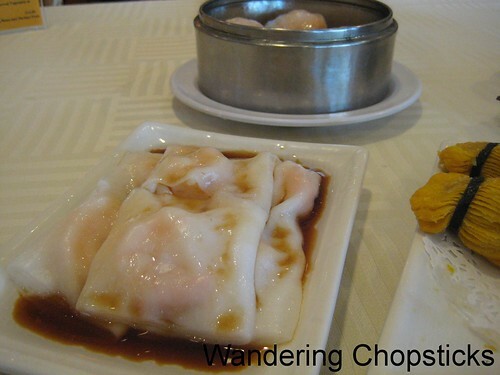 Part of that was because we splurged on fancier dim sum such as the shark fin and scallop dumplings. 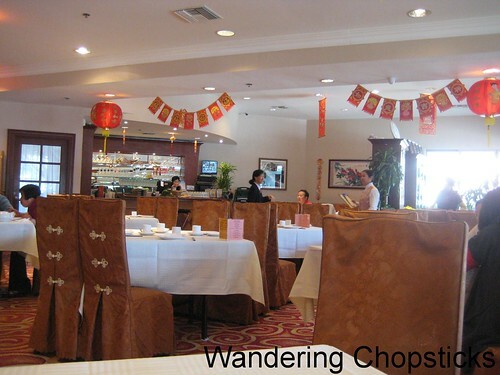 But, the whole time, I kept thinking, the presentation was slightly better and the prices were slightly lower at Lunasia Chinese Cuisine (Dim Sum) - Alhambra. And it's just down the street, so I'd rather go there. But that's just because Lunasia is my favorite dim sum at the moment. The dim sum at King Hua was perfectly fine, but having no good savory dim sum in the small plate price range tipped me away. 3 years ago today, I Ate What? 2008 Eating Out Roundup. 4 years ago today, Tom Tau Hu Ky (Vietnamese Shrimp Paste Wrapped in Bean Curd Skin). 5 years ago today, Pumpkin Curry and Toasted Pumpkin Seeds from the sugar pumpkins I grew in my garden. 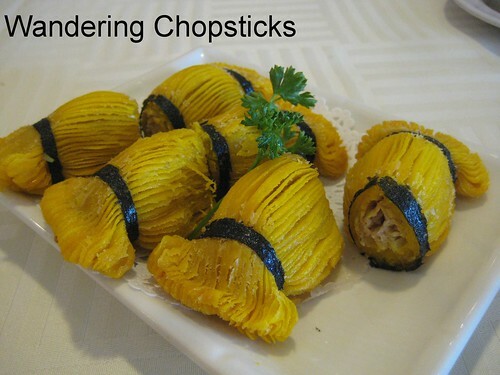 Thank you so much for posting dim sum I've never seen before! 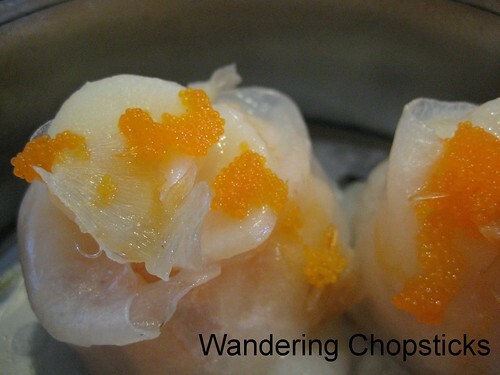 The lotus root and the colorful clear dumplings were new to me.